Published: Sept. 13, 2018 at 03:19 p.m. Updated: Sept. 20, 2018 at 02:37 p.m. The Ravens and Bengals will fight for dominance with the return of Thursday Night Football, Tom Brady will square up against the Jaguars' top pass defense, and the Steelers will attempt to halt Tyreek Hill. See what the numbers have to say with these mind-boggling stats for Week 2. Michael Thomas dominated out of the slot in Week 1 against the Buccaneers. Thomas caught 10 passes on 11 targets from the slot for 96 yards and a TD. 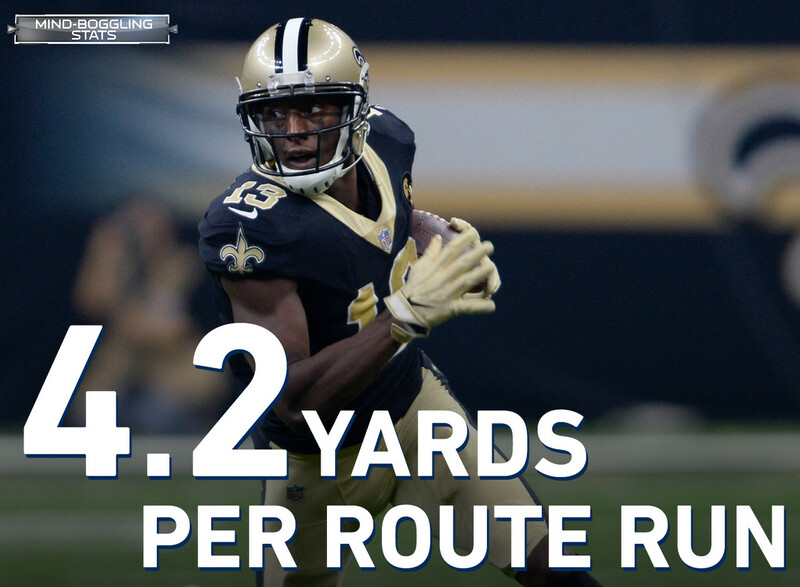 Thomas averaged 4.2 yards per route run on his 23 routes from the slot in Week 1 after leading the NFL at 3.6 yards per route run last season. The Cardinals and Rams feature several marquee matchups. In the backfield, David Johnson and Todd Gurley represent the NFL's leaders in scrimmage yards and scrimmage TD in each of the last 2 seasons (Johnson in 2016 and Gurley in 2017). Tom Brady won't be sweating the trip to Jacksonville and an AFC Championship Game rematch with the Jaguars in Week 2. Brady is 8-0 in his career against the Jaguars (including playoffs), with 19 passing touchdowns and 2 interceptions in those games. Brady is also 6-0 (including playoffs) since 2016 against teams to finish with a Top 5 pass defense. Deshaun Watson has struggled in his career when under pressure. His passer rating decreases by a league-high 63.8 points when under pressure since the start of last season (league-wide average, -28.3), throwing just 6 TD and 6 INT. Watson had the highest passer rating of his career (125.0) in Week 4, 2017 in a 57-14 win against the Titans as Tennessee pressured him on 28.6 percent of his dropbacks, compared to 37.0 percent in all other games. The good news for Aaron Rodgers: His 111.4 passer rating vs the Vikings (including playoffs) in his career is the highest by any QB against one opponent since the 1970 merger (min. 20 games, including playoffs). The bad news: Rodgers is just 4-5 against Mike Zimmer defenses, with a 92.9 passer rating that is more than 10 points below his career average. Thursday Night Football on NFL Network kicks off with an AFC North showdown between the Ravens and Bengals. The all-time series is tied 22-22 and 10 of the last 14 games have been decided by one possession. Can the Steelrs halt Hill? Tyreek Hill is one of the NFL's most dynamic players, averaging 12.2 scrimmage yards per touch since entering the league in 2016. The Steelers look to have figured him out, however. Hill's 4.8 scrimmage yards per touch in 3 games (including playoffs) against the Steelers is his lowest against any team in his career. Ben Roethlisberger's 3 interceptions in Week 1 may be bad news for the Chiefs. Since 2015, Roethlisberger is 3-0 in games following a 3+ interception performance. The last such instance was last season, when Roethlisberger beat the then-undefeated Chiefs in Week 6 after a 5-INT performance against the Jaguars the previous week. The Baltimore Ravens ran five plays in Week 1 vs Buffalo where Joe Flacco and Lamar Jackson were on the field together. Jackson lined up at WR on four of those plays, going in motion each time while being involved in a ball fake or touching the ball on each of the five plays. He touched the ball twice, once rushing for no gain and once throwing an incompletion. The last time the Ravens and the Bengals played (Week 17, 2017), Andy Dalton's game-winning 49-yard TD pass on 4th down with 44 seconds left knocked the Ravens out of the postseason and allowed the Bills to end their 17-season playoff drought. What's up with Dak Prescott? Prescott has thrown 9 interceptions in his last 9 games dating back to 2017, with just 6 passing touchdowns to offset them. That is a far cry from the 39-8 TD-INT ratio Prescott posted in his first 24 career games. The Jaguars rank first in pass defense since 2017 (172.2 YPG allowed).